As schools move into a digital, online world with the use of tablets and student owned devices increasing, managing online student safety is a top priority for IT personnel. At Barracuda, we’ve got a long history of working closely with the education sector to help them use technology to keep pupils safe. Earlier this year, we wanted to get closer to the top concerns for schools’ IT departments, so we conducted a study of professionals responsible for technology within UK schools and colleges, focusing on the safeguarding of pupils. We conducted the survey of attendees during the Bett Show in London, January 24-27, 2017, and some of the highlights are below. 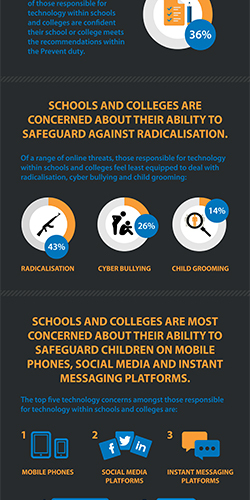 Radicalisation came up top as the number one concern, with 43% of those responsible for technology in schools feeling least equipped to safeguard pupils from radicalisation, far more than cyber bullying (26%) and child grooming (14%). In 2015, the Government’s Prevent duty was relaunched to help organisations, including schools and colleges, protect pupils from radicalisation and extremism. However, nearly two thirds (64%) aren’t confident their institution meets all of the duty’s recommendations and only 12% are completely confident in their organisation’s effective use of technology to implement Prevent. In fact, even basic awareness of the Prevent duty was low with over a quarter (26%) saying they hadn’t even heard of it. Why are so few organisations following the Prevent duty? Interestingly, lots of respondents feel like there’s a lack of support on this issue: Over half (52%) think the Department of Education has not provided enough information and support on using technology to safeguard children against the issues covered by the Prevent duty. It also seems like there’s an inadequate amount of investment into technology, which is contributing to the issue. Three quarters (75%) of respondents said their institution has not invested in technology to help identify and manage risk areas in relation to terrorism. Over a third (39%) said they have no idea how well their core technology service and solution providers understand the Prevent duty. On top of this, investment in the training of staff and pupils is surprisingly low, with less than a fifth (19%) of respondents saying their setting has invested in staff training around the Prevent duty. Only a quarter (25%) say their setting has invested in pupil awareness. Despite the Government’s Prevent guidance aimed at schools and childcare providers, there is a distinct lack of clarity, knowledge and understanding of how to tackle safeguarding issues. While this measure is intended to help schools, clearly more education is needed. Schools play such an important role in equipping young people to stay safe online that those responsible for technology need to ensure they’re investing in the best tools and training to protect students’ safety. “These indicative findings suggest there is still much work to do. Whilst technology can offer some safeguards, ultimately, educators and those with responsibility to safeguard our pupils must look for more effective ways to engage them on issues that affect them like online radicalisation, sexting and cyberbullying. If you’re feeling concerned, you are not alone as these survey results show. Keeping pupils safe requires multiple layers of security technology and training. One of those layers is suitable web filtering technology to keeping children safe from the growing amount of online terrorist and extremist material. Too often broad-based blocking of entire generic categories of content gets in the way of enabling pupils’ learning, encouraging children to find alternative means to access the content outside of the school’s network. Any filtering system needs to offer granular settings for specific control over what your students can access. 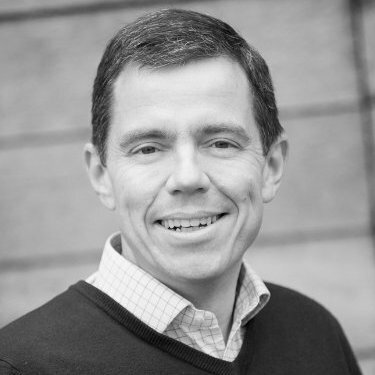 Chris Ross is Senior Sales VP, International, Barracuda, with strategic & operational responsibility for world-wide markets. Connect with him on LinkedIn here.